Lier (Lierre in French; pop. 33,000) has an amazing number of sights for a town of its size. It has been nicknamed the "Little Bruges", or Lierke Plezierke ("Little Pleasure Lier"), or else Pallierterstad ("town of Pallieter"), from the famous character of local writer Felix Timmermans (1886-1947), the most translated author from Flanders. 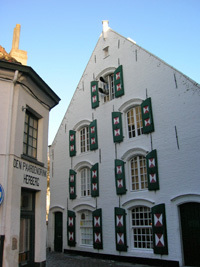 The inhabitants of Lier also earned the teasing nickname "sheep's heads" (schappekopen in Flemish) for choosing a cattle market over a university when asked which one they wished for. 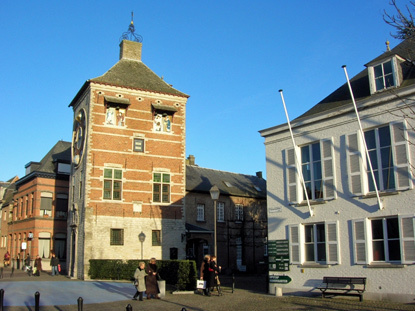 Lier was probably founded in Roman times, but the first mention of its name doesn't come until the 7th century. The legend has it that Saint Gummarus (died 775), a nobleman from Carolingian king Pepin the Short (714-768)'s court, set his hermitage along Lier's River Nete. 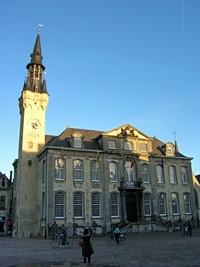 Lier obtained its city charter in 1212. Not much happened there, except for being the birthplace of the not-so-famous-outside-Flanders painter Opsomer (1878-1967), ornamental smith Van Boeckel, writer Timmermans and clock-maker Zimmer. All the sights are concentrated in a compact area. Like most other Flemish towns, Lier has its late-medieval Grote Markt (town square) with a sumptuous Flemish-Rococo-style town hall and a an adjoining belfry (built in 1369). 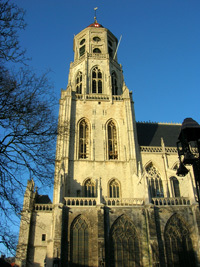 The Brabantine Gothic collegiate church dedicated to St Gummarus, the town's patron saint, also sits on the town square. One of the most interesting monument is the 14th-century Zimmer tower (Zimmertoren), once part of the city wall and converted into an astronomical clock by Louis Zimmer in 1930. It has a central dial for time surrounded by 12 smaller dials showing he signs of the zodiac, the lunar and solar cycles, the 7 days of the week, 12 months of the year, seasons, tidal waves, and more ! Statues of the town's mayors and Belgian kings dong the bell every hour on the right side of the tower. Inside the tower, a planetarium displays no less than 57 astronomic dials with some intriguing cogwheels. Note that Zimmer's astronomic clock was shown at the 1939 World Fair in New York. The last important tourist attraction in town is the Beguinage (Begijnhof), considered to be one of the most beautiful in the country. Founded in the 13th century, it reached its apex in the 17th century, like many other beguinages in Belgium. 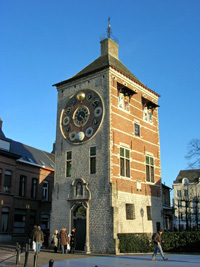 Lier is 17 km to the south-east of Antwerp, from which there are frequent trains (about 15min). Direct trains from Brussels-North take 35min. By car, take the N10 between Antwerp and Aarschot, or the N14 from Mechelen. From Brussels, take the E19 till Mechelen, then the N14.